Posted August 12, 2017 by Diane & filed under Book Recommendations. 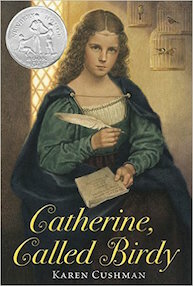 A list of medieval books would never be complete without Newbery Honor-winning Catherine, Called Birdy, a rich story by Karen Cushman of a 13-year-old girl’s attempt to escape a typical medieval woman’s fate. Filled with magnificent historical detail, the novel is a diary written by Birdy at the suggestion of one of her brothers (the only one she really respects). She’s no princess, just the daughter of a minor knight, yet she deals with unwanted marriage proposals like any fairytale maiden (well, like a singular one): through trickery, including attempts to utterly repulse potential suitors. Birdy’s ploys work until her father betroths her to a lord more disgusting than anything she could have come up with. Her protestations and ideas to escape that engagement fuel the main plot. Birdy’s world is no melodic, clean, medieval paradise, but a real world: with fleas and filth, unbearably tedious “lady-lessons,” a blustering beast of a father, and disasters in spinning and weaving. Cushman depicts manor life and village life in vivid detail, from home remedies (“a gargle of strawberries, water, vinegar, and the dung of a white dog”) to the excitement of a village hanging (which changes quickly to horror for Birdy, at least, when she sees who the convicted “bandits” are: two scrawny, frightened 12-year-old boys). Chapters—diary entries—start with just a date early in the novel, but soon include a commentary on saints and holidays assigned to that date, and these are one of this novel’s pleasures. For instance: “29th Day of March, Feast of Saints Gwynllyw and Gwladys, who bathed in the river Usk summer and winter and went for long walks completely naked until their son, the holy Cadoc, made them stop”. Birdy obeys the rules of her world in some respects, but also frequent questions those rules. Her adventures and her voice are a delight for anyone interested in medieval life.